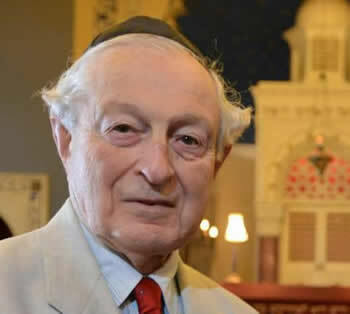 Menorah is privileged to welcome Rudi Leavor, President and Chairman of Bradford Reform Synagogue, to talk about his life and inter-faith work within the Bradford Jewish community. Rudi, who is 92, was born in Germany but left in 1937 with his parents and sister, settling in Bradford and running a successful dental practice. At the age of 86, with assistance from the local Muslim community, Rudi was involved in restoration work on Bradford’s Grade II listed synagogue building and was recently presented with the British Empire Medal in recognition of services to the Jewish community and inter-faith relations in Bradford. Last year this work was the subject of a programme on Radio 4. Please come to welcome Rudi to our community and to hear his fascinating history. As always, we start at 10.30 with coffee and bagels.